As a firm believer of the potential of big data for conservation biology, last year I co-organised a workshop at the UQ node of CEED together with Alienor Chauvenet (UQ), Jose Lahoz- Monfort (UMelb) and Michael Bode (UMelb) on “Big Data hits Conservation Biology”. 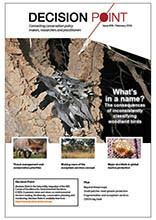 Over 30 researchers from the University of Queensland, the University of Melbourne and Southern Denmark University got together to assess how big databases such as COMPADRE and COMADRE, among others, can be used to address pressing conservation questions in Australia and around the globe. Forthcoming manuscripts tackle these questions. We are currently working on two pieces that make a call for conservation scientists to avail themselves from all the large open-access ecological and evolutionary databases that have emerged in recent years. Another manuscript that I am leading as a result of this workshop examines the possibility to use anatomic and physiological traits as shortcuts of demographic information to predict species invasions and extinctions. Alienor Chauvenet is co-leading a manuscript on testing the ecological hypothesis that animal species’ growth rates (extracted from COMADRE) are higher at the centre of their range, than on the edge. Ultimately, I hope that the further development of COMPADRE and COMADRE will allow for a better integration of demographic data with other open-access databases (such as BIEN, GBIF, IUCN, GeneBank) to address global questions in conservation science.